Have you guys shopped the Missguided Plus Size range yet? If not, you need to. Its amazing!! Its fair to say I’ve been a fan of Missguided for a pretty long time. They’re stuff is always on trend & affordable & I find myself browsing their new in section almost daily. A girl gotta shop ok?! I literally jumped for joy when they finally released their plus size range and today I’m bringing you this collaboration. Eeek! On average, I’m a size 16 but I fluctuate to a 14 and an 18, it all depends on the brand and material. With floaty dresses sometimes I size up because I’m tall and need a little length in the back. 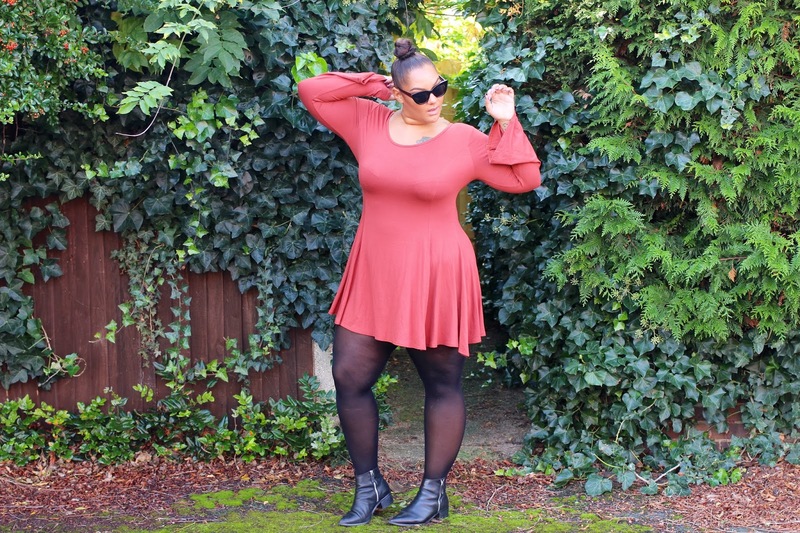 This beaut rust a-line dress is a great fit. It shows off my curves & the bell sleeve detail makes it so on trend – I’m feeling the 70s vibe for sure. I just think the drop off this dress is super flattering and also ridiculously comfortable. I love it! Im also pretty in love with this faux suede biker jacket which I also have in mustard too. I live in my leather jacket so this black suede alternative is fab for when I want to change it up. Again, its bang on trend and its also an easy way to wear suede. Its super cute and slowly becoming a staple in my wardrobe. YAS! 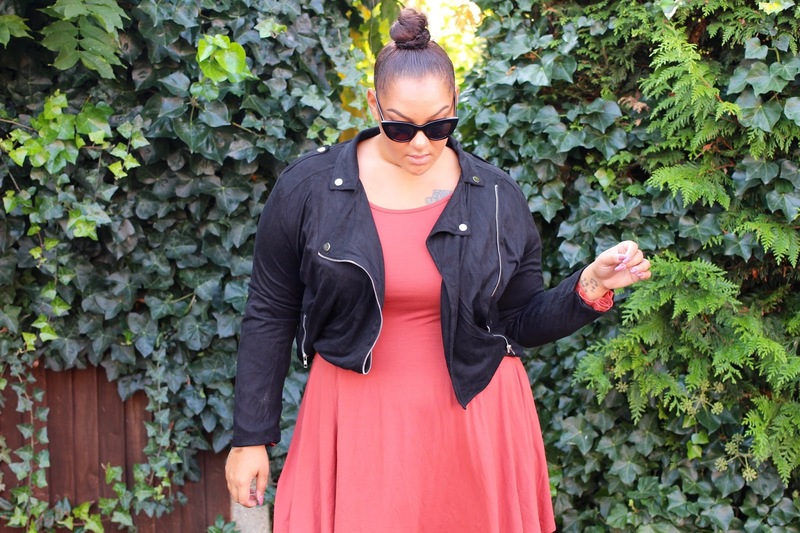 Dresses, tights and cute jackets is my go to style for a/w. Its fun, chic and also great for everyday, effortless style. My Missguided wishlist is now out of control but I can’t help myself. Massive congrats to them for making fashionable & well fitted clothes for girls who have a bit more shape! Gorgeous shade on you too ! That dress fits like a dream on you, very flattering on your curves. Love the jacket too! I love the dress especially the colour. You look amazing btw ! you really do inspire me and when I watch you videos and stuff I just think to myself we are basically the same person lol.